I'm addicted to shopping. Unfortunately, I don't always have the money to buy all of those fabulous clothes, so I began to think of different ways to wear the clothes I already have. I started with the basic white tee shirt and came up with some really cute and simple combinations! For the first outfit, I am wearing my white tee shirt (Hollister), a pair of jeans (Abercrombie), and two long, dangly necklaces (Charming Charlie and American Eagle). I love this because it is so simple but it still looks put together. You can even switch out the normal jeans for some cute colored or patterned ones! For shoes, you can pretty much wear any kind. For the second outfit, I am wearing the tee shirt with a pair of flowy shorts that I made. I also have on a brown, wide belt (Target) and a long necklace with a leopard charm on it that I made. 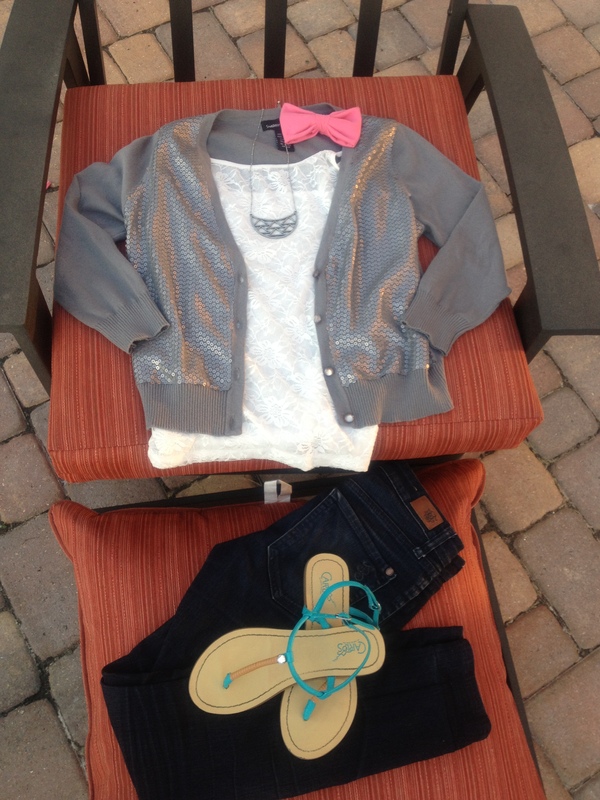 This outfit is cute for a spring/ summer day! I suggest wearing sandals to complete the summery look, and maybe some pretty wedges! For the third look, I am wearing the tee shirt with a lace high low skirt (Charlotte Russe) and a tribal looking bib necklace (Charming Charlie). This look would be perfect for those days when you don't have time to put together an outfit, and you're looking for something dressy. Wear some simple sandals with this outfit so you don't overpower the skirt. Finally, for the last look, I paired the tee shirt with a black, fitted leather jacket (Aeropostale) and some tribal patterned, high waisted shorts (Charlotte Russe). This outfit is fun and super simple, just like the other looks! Nice for a night out during the summer. I hope you liked these outfits! 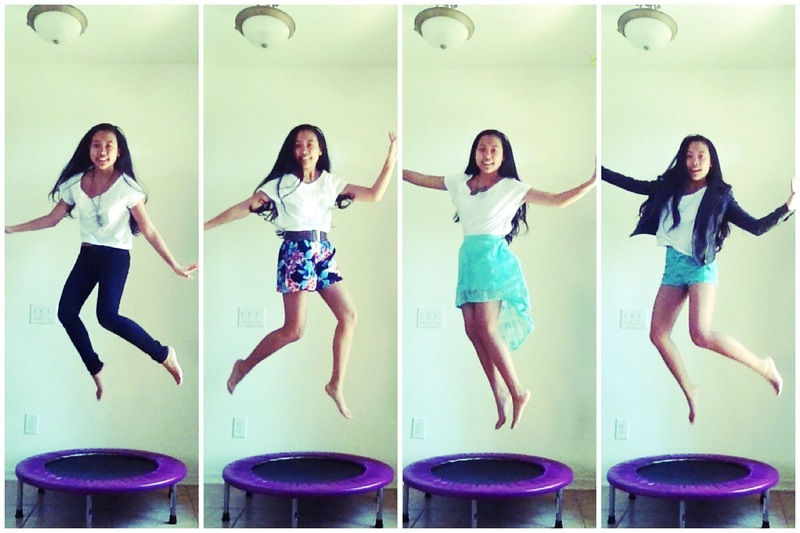 You can recreate them with your own clothes and even mix them up a little! (The leather jacket would look great with any of the other looks!) Anyways, just remember... you don't have to go shopping to find new outfits. Just find new combinations from old clothes! Be creative! Step 1. Cut out a big rectangle that is about 11" by 12", a small rectangle that is about 2.5" by 7", and a small strip about 0.5" by 6". Step 2. 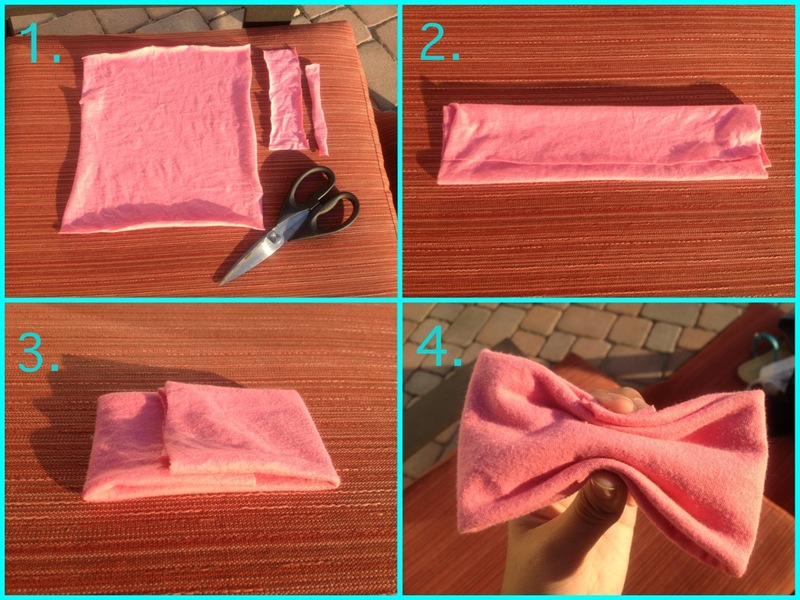 Fold the big rectangle (11" by 12") until it is the width you want your bow to be. Step 3. Fold in the sides of the same rectangle in so that they overlap each other in the middle so that it is the length you want your bow to be. Step 4. Pinch and fold the rectangle so that it creates the bow shape. Step 5. 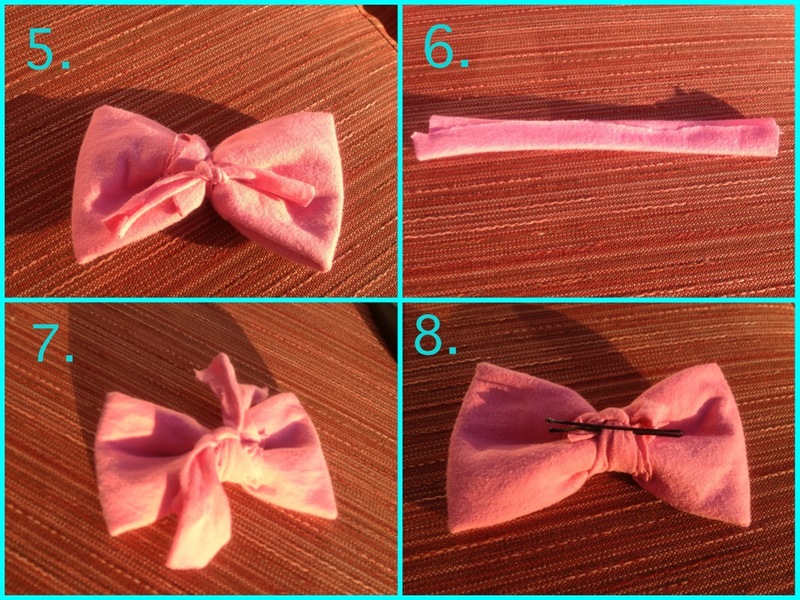 Use the small strip (0.5" by 6") and tie it tightly around the middle of the bow so that the folds stay. I made a triple knot. Cut off the extra fabric strips off. Step 6. Take the small rectangle (2.5" by 7") and fold the cut edges inward so you can't see them on the other side. Step 7. 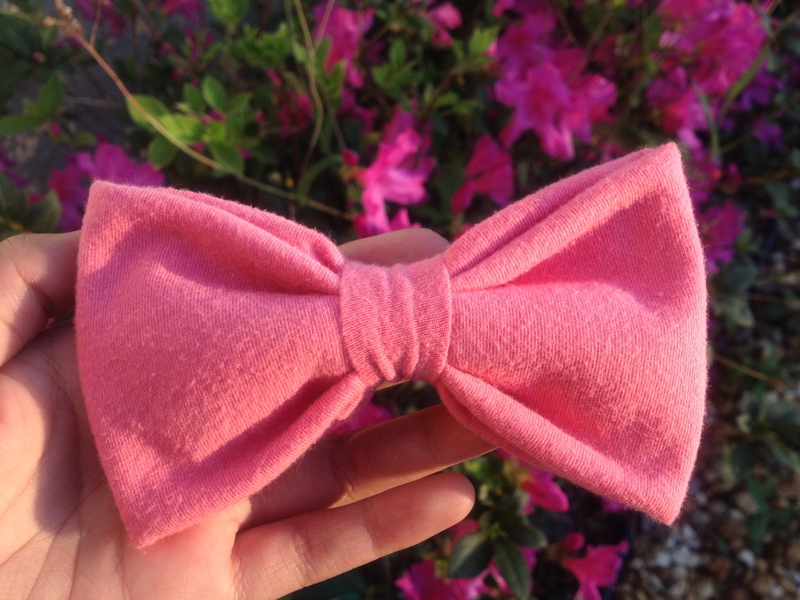 Tie the small folded rectangle tightly around the middle of the bow. Cut off the extra fabric strips. Step 8. Insert the bobby pin in the back of the bow by the knot. I hope you enjoyed this tutorial and outfit! Have a fabulous day! !